Besides today being 1-11-11, it's an anniversary of sorts. Yesterday marked the end of my eleventh year working at my current job. Other than being a mom, this is the longest I have worked anywhere. Company policy prohibits us from mentioning where we work in blogs or on social networking sites. The company philosophy is that we come in, do our work and leave. We are "under the radar", so to speak. We provide support to our clients. We have their back, but we aren't to be out front in the glare of the public eye. In 11 years, I have seen our equipment go from stuff that was 20 pounds and 3 feet long to machines that are the size of bricks and are 2 pounds. Trying to get wireless communications to work required a degree in electrical engineering and knowing that the times from 6-9 a.m. and 4-6 p.m. were the heaviest cell communication times and we'd be last on the priority list. Now, we have 18 machines shooting a cell signal through the basement of high-rise buildings. I've been everywhere in Chicagoland doing my job. I've made good friends and established good working relationships with companies. It's to the point that some guys don't need to identify themselves when they call. I know them by voice. I've been a part of some very unique and high profile jobs. We can look across the landscape of Chicagoland and say, "We were there. We were there. Oh, and we were there, too." I've been a part of 2 economic downturns, which we weathered, coming back a stronger company the first time and, I have no doubt, a stronger company after this latest dip is over. There have been problems and frustrations, to be sure. I've left this job at the end of the day determined that the next day would be my last, that I didn't have to "take" this anymore. I've left this job thinking, "Man, this was an incredible day. We rock." I've left exhausted. I've left exhiliarated. This job put my daughter through college and helped her get on her feet. This job bought me my Jeep, keeps me in my house, pays for cat food and kitty litter and the occasional beer and pizza after a long day. In a world where the "lifetime" jobs our grandparents and even our parents knew are non-existent, 11 years on one job is kind of an abnormality. This is the kind of job that I would stay at unless they have no use for me or until I retire. I know a lot. I've learned a lot. It's been a great job for me. 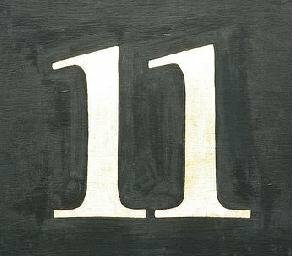 So, on 1-11-11, here's to 11 years of driving all over Chicagoland and here's hoping there's another 11 ahead.